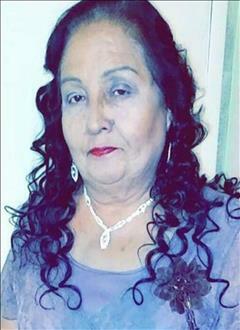 Esther V. Soriano, 69, of Brownsville, passed away on Thursday, April 4, 2019, at her residence. She is preceded in death by her father, Jose Cruz Valenciana; siblings, Socorro, Rodolfo, and Jesus Valenciana. Mrs. Soriano is survived by husband, Joel L. Soriano; 7 children, Manuel (Elizabeth) Soriano, Rosa (Jose Garcia) Soriano, Olga Soriano, Soledad (Vicente) Elvira, Angela (Luis) Martinez, Margarita (Gabriel Trejo) Soriano, and Joel Soriano III; mother, Maria del Refugio Valenciana Navarro; siblings, Martin, Enrique, Maria Elena, Jose, Maria del Carmen, and Ramiro Valenciana; 16 grandchildren, 5 great-grandchildren; and numerous nieces and nephews. Visitation will be held from 1 pm to 9 pm with an evening service at 7 pm on Saturday and Sunday, April 6-7, 2019 at Garza Memorial Funeral Home. Chapel Service will be at 2 pm on Monday, April 8, 2019, at Garza Memorial Funeral Home. Committal will follow at Buena Vista Burial Park.